Which Gutter Style is right for My Home? | Rain Gutter Pros Inc. 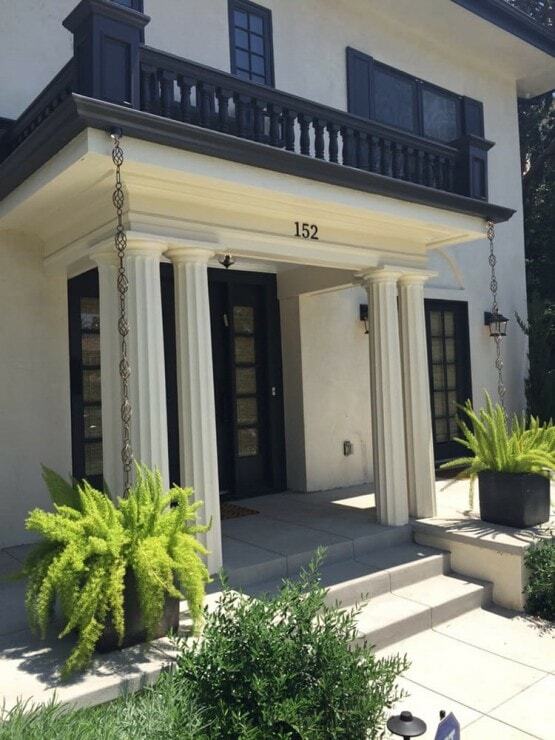 Choosing Gutter Styles to Complement Architectural Styles? Charming and beautiful, Spanish Colonial homes are considered highly functional and well-suited to the Californian environment. The architecture of these homes can be traced back to hundreds of years ago, when the first Spanish settlers came to the area. The style has been admired and replicated ever since. 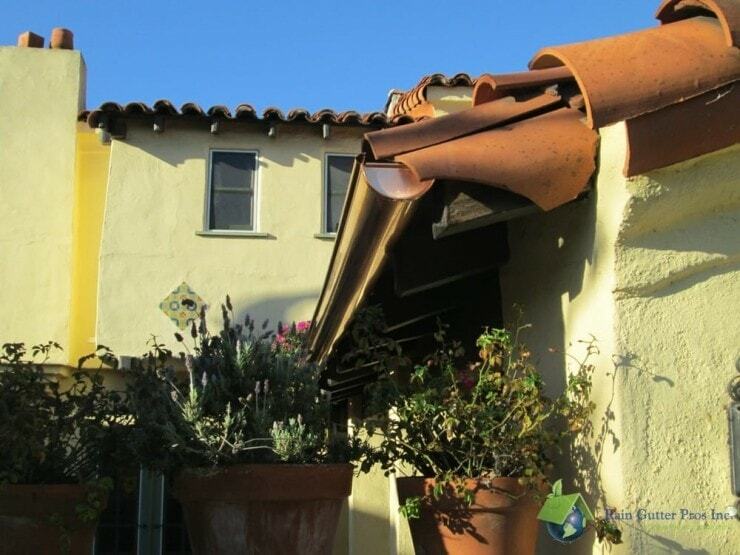 To deal with the occasional downpour of rain, Spanish Colonial homes are often outfitted with half-round gutters. Half-round gutters are largely self-cleaning due to their shape, and can carry a lot of water due to their wide diameter. Copper rain gutters are known for their durability as well as their good looks . Furthermore, as a material that’s been in use for centuries, it complements “traditional” architectural styles very well. That said, it is the most expensive gutter materials and half-round gutters in other materials also appear very fitting with Spanish Colonial architecture. The brick construction, shutters, multiple chimneys, and entryway pediment of Colonial Revival homes lend an air of stability and elegance. Many Colonial houses are large, two-story homes with angled or hipped roofs, exteriors made from brick or wood, with features that are arranged symmetrically. The roofs commonly seen on Colonial Revival homes contain a flat fascia board, which is best suited for K-style gutters. These gutters give the appearance of crown molding when looked at directly. They hold a large amount of water and are available in a wide variety of materials. Tudors evoke the timeless style of country houses from medieval England, typically featuring an exterior consisting largely of herringbone brick, tall and narrow leaded glass windows in the shape of diamonds, multiple chimneys, and half-timbered facades. 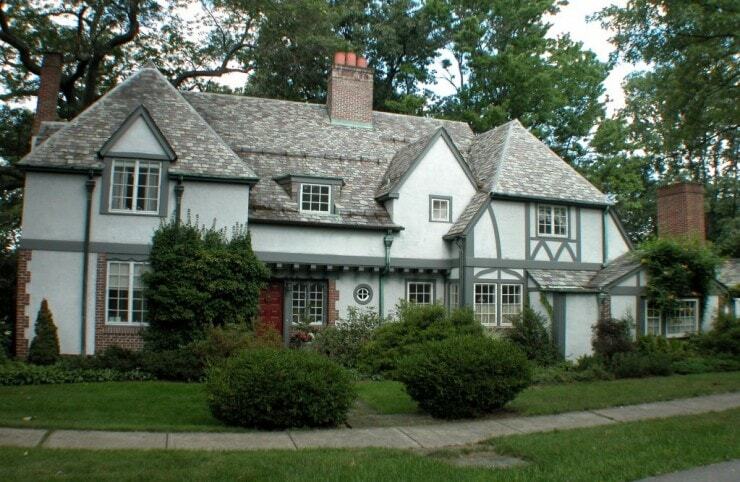 Like Colonials, Tudor homes gained popularity in America during the late eighteen-hundreds. Found more commonly on the East Coast or Midwest than California, they’re nonetheless one of the more distinctive architectural styles found throughout the US. As with Spanish Colonial homes, the preferred gutter choice for Tudor homes would be half-round gutters. While copper is one of the more expensive materials, its beauty and longevity make it a worthy investment for a Tudor style home. As seen in the image above, copper develops a patina with aging and weathering. Some prefer the shine of brand new copper but some styles are actually better complimented by weathered copper. Due to the fact that they were in use in past centuries, a half round gutter in any material will generally complement the traditional look of a Tudor style home. 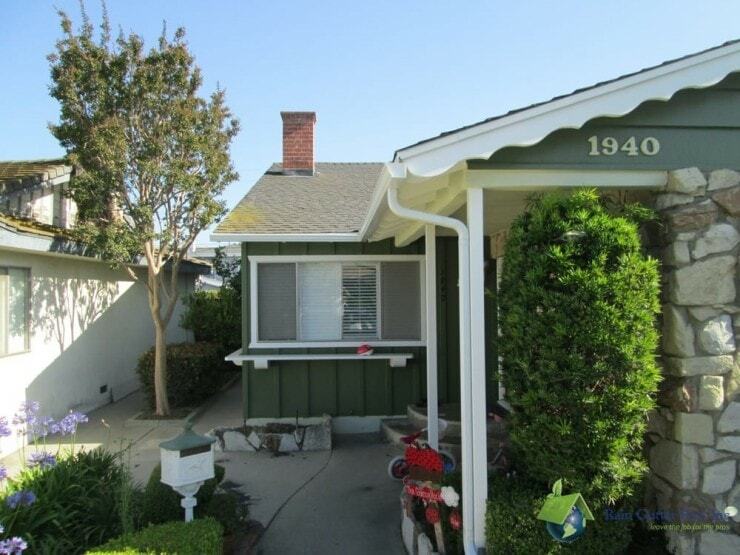 Usually one or one-and-one-half story houses, California Bungalows feature sloping roofs and unenclosed rafters. The exterior often utilizes wood shingles, horizontal siding or stucco, as well as chimneys made of brick or stone. While originally California Bungalows featured gutters made of wood, today one can find both half-round and k-style gutters paired with them. For a more traditional look, homeowners can consider half-round cast-iron gutters, which are often used with heritage properties and are known for their strength and durability. For a less-expensive alternative, homeowners may opt for half-round seamless aluminum gutters that are painted to match the color of the home. Alternatively, K-style gutters are often installed on bungalows to great visual effect. For an “Americana” look, K-style gutters may actually look more appropriate. All of this said, there are no rules when it comes to choosing rain gutter styles to complement your home. We’ve seen some unconventional choices that end up creating uniquely pleasing aesthetics. We encourage you to speak to us or local experts to find out what’s possible. Every project is limited by budget and the necessities of a function. But, beyond that, a little creativity can turn something that may have seemed like simply a necessity into a genuinely beautiful element of your home!